✦ Double GD/XP Event! Every Game Dollar earned and experience will be doubled during this entire weekend. Don't miss it! ✦ Double Daily Reward! You will get your Daily Reward every 12 hours instead of 24 hours! ✦ Every player who logs in during the Week will receive the Ex-Military Gamescom clothes. 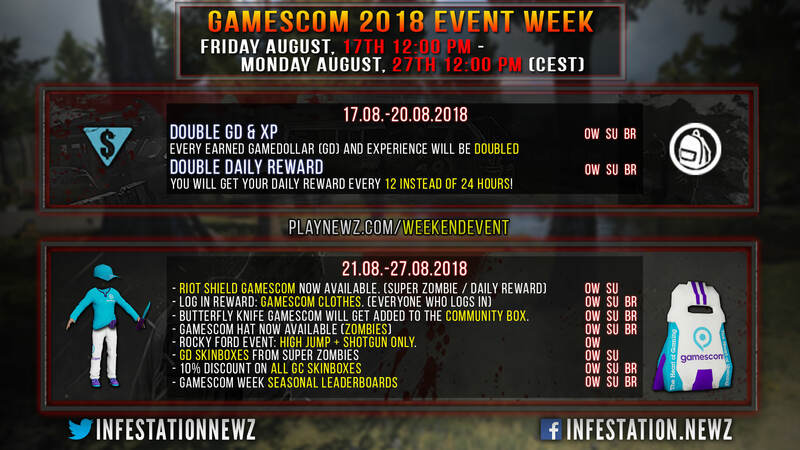 ✦ The "Baseball hat Gamescom" will be available by killing normal zombies. ✦ Special PVP Server event: There will be 1 Rocky PVP Server available with the "High Jump" & "Shotgun Only" in each region. ✦ GD skinbox Hunt: There will be a chance to get GD Skinboxes by killing Super Zombies. ✦ There will be a discount of 10% on every GC Skinbox in the marketplace! ✦ Seasonal leaderboards will be activated during the whole week. Good luck! If you have further feedback, ideas or comments please let us know in the comments on this thread. We hope you all have a great weekend and an enjoyable Gamescom Week! What is Gamescom? But clothes is fine. Any weekend that I can get double GD is a great weekend, and it's good to see the GAMESCON push is huge! This helps to really bring more players to the community, thank you for thinking to help keep things growing for all of us so we have something to continue enjoying. "omg worse and worse "
Such definitive answers and so constructive right?? It's a giant event where gamer's alike gather to explore game's / developers go to showcase their creations. "So ? Gamescom could bring good ideas for the game? well ... that's what I think I understand :)"
Just so you all know: We're back in the office and back to business!